The perfect personalised gift for Family and Friends at Christmas or just as a special present., This item measures approx. 7cm tall and 7cm in diameter. 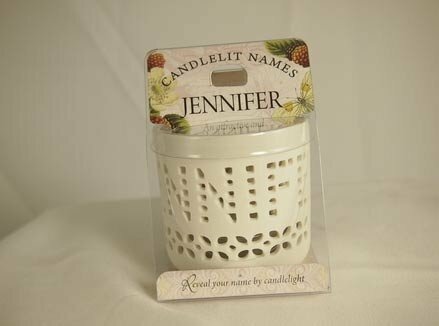 This includes a scented tealight., A gentle glow of candlelight reveals a delicately cut out name design., PLEASE NOTE: Although your chosen design may not be shown in the attached photo, it will be dispatched out to you on completion of order., SAFETY WARNING: Never leave a burning candle unattended. Always place on a heat resistant surface. Keep out of the reach of children.